Height 60 cm. Saint Petersburg, The State Hermitage MuseumInv. No. A. 149. Unknown; from a palace at Tauris. 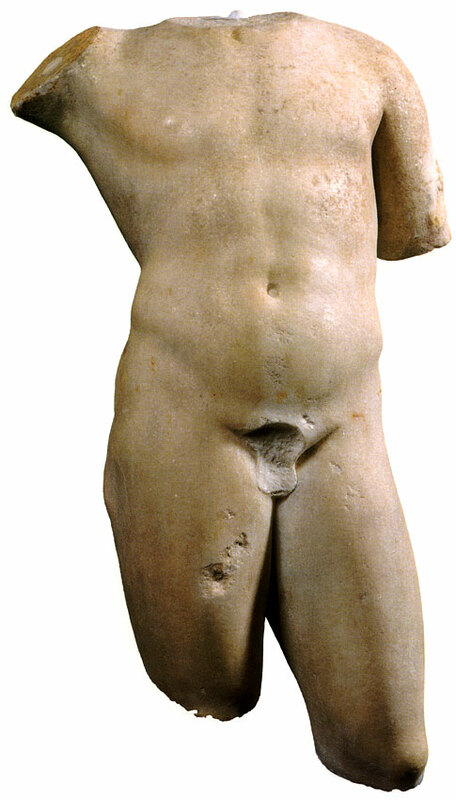 The ephebe’s weight is on his right leg; the left leg is bent and placed behind him. The left arm was hanging down and the right arm raised to shoulder-height. The musculature, the angle of the pelvis and the folds of flesh on the hips are not very accentuated. The modelling is fluid and the work quite fine. © 1993. Photo, text: Olympism in antiquity. Olympic Museum Lausanne. Bertelsmann UFA. Industria Gráfica S. A. Barcelona, 1993, p. 86 cat. no. 29. © Photographer — M. Verhasselt (Brussels-Dilbeek).